Side by Side Singing – Come sing with us! of the Hendersonville library, 301 N. Washington St., Hendersonville. the lot across the street. spirit better than singing! We hope you will come sing with us! Wear your elf ears, your Santa hats and bring your jingle bells!!!! When you arrive at Side by Side Singing you will be greeted by the smiling faces of our volunteers. On the far left (above) is Beth Mallindine, then Ruthie Rosauer, Liz Hill and on far right is Jan Mallindine. Today we sang at Calvary Episcopal Church in Fletcher, North Carolina. Next week we will be singing in the Kaplan Auditorium of the Hendersonville Public Library (301 N. Washington St.) at 2pm. We will also be singing at Calvary Episcopal Church (corner of Old Airport Rd. and Highway 25 (aka Hendersonville Highway) in Fletcher) at 2pm on Thursdays, August 23 and August 30. All sessions are free! Please NOTE: the September session originally scheduled for the Hendersonville Library has been cancelled due to remodeling of the building. Pictured above is Debbie Nordeen on the piano and Ruthie Rosauer standing. able to read music to participate fully. Lyric sheets are provided. Let Me Call you Sweetheart and Oh What a Beautiful Morning. will provide guitar and piano accompaniment. Both locations are handicap accessible with free parking. We hope you will come sing with us! All events are free. All are handicap accessible. We hope you will come sing with us! You remember how librarians used to “shush” people if they so much as whispered in the library? Well, that rule will be set aside on Thursday, February 8 from 2 – 3pm as singers gather to sing “Side by Side” in the Kaplan Auditorium of the Hendersonville Public Library. The library is located at 301 North Washington St. in Hendersonville, NC. Side by Side Singing is community singing for EVERYONE. We will do a few vocal warm-ups and then proceed to singing old favorites such as “Take Me Out to the Ballgame” and “This Land is Your Land.” Music can be a wonderfully empowering component in healthy aging. But we like to sing because it is fun! 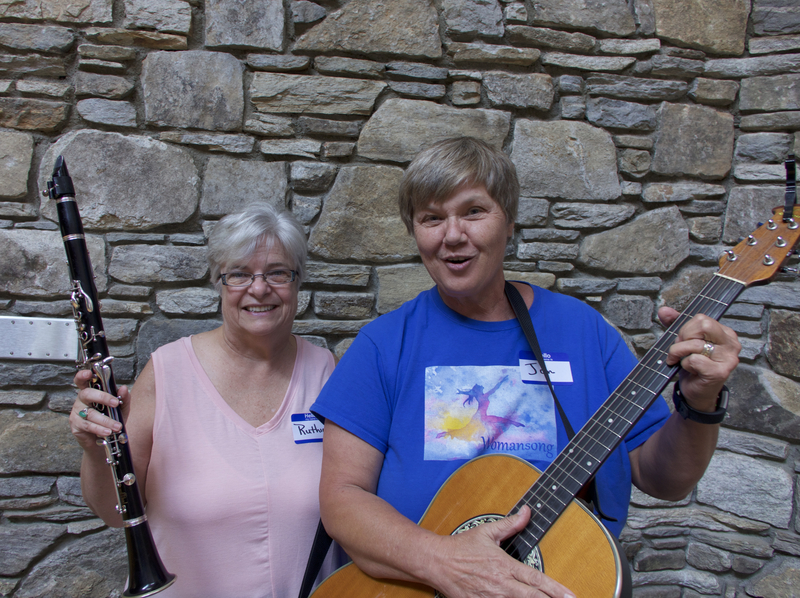 Song leaders Jan Mallindine and Ruthie Rosauer will accompany the group on piano and guitar. You need not be able to read music or be an experienced singer. Anyone who enjoys singing should come sing with us. The event is free and lyric sheets will be provided. Ruthie Rosauer (left) and Jan Mallindine will be songleaders February 8, 2018.